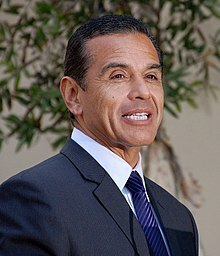 Antonio Ramon Villaraigosa (born Antonio Ramon Villar, Jr. on January 23, 1953) was the mayor of Los Angeles, California from 2005 to 2013. He was elected on May 17, 2005, defeating the mayor in office, James Hahn. He was then re-elected for a second term in 2009. Before his mayoral experience, Villaraigosa was the California State Assemblyman for the 45th District, the Speaker of the California State Assembly, and the Los Angeles City Councilman for the 14th District. Before being elected to public office, Villaraigosa was a labor organizer. Villaraigosa served as a national co-chairman of Hillary Rodham Clinton's 2008 Presidential campaign, and as a member of President Barack Obama's Transition Economic Advisory Board. In 2013, he could not run for a third term because of term limits under California law. Eric Garcetti succeeded him on July 1, 2013. "Biography from the Office of the Mayor of the City of Los Angeles". Archived from the original on 5 June 2008. This page was last changed on 22 April 2019, at 13:26.